Boundless energy. Infinite enthusiasm. (And they’ll love never anyone as much as they love you). Your dog might just be your perfect running buddy. A dog will never refuse a workout, won’t complain if it’s raining or cold out, will be only too happy to do an extra mile or two if you are feeling good and will never be late for your workout. But it doesn’t stop there. Dogs provide us with companionship, as well as security when out on the road, especially when running in remote areas. Running with a dog is great for both the owner and the hound, but to ensure you both get the most out of this partnership there are several important factors to consider. Some breeds are better suited to running than others. Giant breeds such as Great Danes, dogs with common hip issues like German Shepherds and dogs with common respiratory issues such as bull dogs are not ideal for running and while they should exercise, too much pavement pounding could do them harm. The best dog breeds for running are generally mid-sized, not too heavy, have short coats, are lean and well-muscled and have a good temperament. Purebreds are more prone to genetic disorders that may be made worse by running so consult a reputable breeder/vet if you are after a dog specifically to be your running partner. Breeds that were originally bred as hunters, herders or carriage dogs are generally the best dogs for running. Some breeds are great for long, slower paced runs while others are better suited to shorter, faster runs. Greyhounds are renowned sprinters while Huskies will literally run all day and night. Choose the breed that best suits your running abilities. Running with a dog that is too young could result in permanent injuries to his still-growing bones. Check with your vet and follow their advice as to when it is safe to start running with your dog. Likewise, as your dog ages, you will need to adjust your running frequency and mileage to allow for a drop off in performance. Like you, your dog’s tolerance for exercise will decline with age. Like humans, dogs breathe harder and faster when they exercise. But dogs don’t just pant because they are out of breath; they also do it to control their temperature. As this is not an especially efficient way to regulate temperature, dogs are prone to overheating when they run. Be sensible and leave your four-legged friend at home if the weather is hot and make sure you either carry water or pass several suitable sources of drinking water so your dog can rehydrate en route, since panting increases the loss of fluids. Short haired dogs are more suitable for exercising in warmer climates; a Husky may well find running in high temperatures very uncomfortable. Be aware that some breeds are prone to sunburn so use an animal-appropriate sun screen on areas that may be prone to burning e.g. nose and ears. 4. Is your dog in shape? Like humans, dogs can be unfit if they have not been exercising enough lately and, also like a human, doing too much exercise too soon can result in muscle or joint soreness and even injury. If your dog is new to running, start off slowly and only run relatively short distances initially. Build up your speed and mileage gradually so you do not overload your dog’s muscles and joints. Your dog will run with you just to please you, so it is important that you control how much running they do; you are their coach! Make sure that you inspect your dog’s paws after each run to check for signs of wear, tear or injury. Adjust your dog’s food intake according to the amount of running you are doing; like you, they need to eat more if they are especially active and should eat a little less when they don’t exercise as much. Being outside is your dog’s cue to poo and as a responsible dog owner, it is your job to deal with this. Make sure you carry a supply of dog poop bag or a pooper scooper so you can bag and bin whatever your dog discards. If you are running in the countryside this may seem extreme or unnecessary but as dog feces contains germs and other people may also use the same areas, it’s simply a matter of social responsibility and good manners. 6. Leash or run free? If your dog is well trained, it will probably happily trot alongside you as you pound the pavement. However, even the best trained dog may experience a moment of madness and chase off after a cat or veer off course toward another dog or, unthinkably, into traffic. If you are running in the countryside, you may also come across other wildlife, livestock or even farm animals. For safety, consider keeping your dog on a leash most if not all of the time when you are running, as one indiscretion by your dog could have serious consequences. Use a lunge leash – a very long leash – so that your dog has a degree of freedom but can still be reeled in when necessary. When you head out for a run, you lace up your shoes and head out with little or no thought as to the surface on which you will be running. Your shoes provide your feet with lots of protection so you can pound pavement or trails with impunity. Your dog has no such protection so consider the running surface on which you take him for a run. Trails are undoubtedly the best surface for your dog to run on and grassy fields some a close second. Sandy beaches are also a good choice. Running on the roads is fine but try to keep your road mileage to a reasonable level and get off road whenever you can. Be aware that high temperatures can cause road surfaces to become unbelievably hot so leave Fido at home if the sun is hot enough. No one loves your dog more than you do and some people are actually scared of dogs. So if you’re approaching another pedestrian, cyclist or runner, pull over to the side of the trail, take control of your dog and let the other person pass by unencumbered and unaccosted. Keep your dog on a short leash if you are running in a busy area or, better yet, stick to areas that aren’t populous. Teach your dog that running time is serious and not play time – he needs to learn to run with you, be well behaved and understand that you are the pack leader. Make sure you pay attention to your dog’s behavior and adjust the amount of running you are doing if he seems tired or lacks enthusiasm for running. Like you, it is possible for your dog to become over trained due to too much exercise and insufficient rest. If your normally enthusiastic running partner looks like he’d prefer a day off then err on the side of caution and don’t force him to run with you. 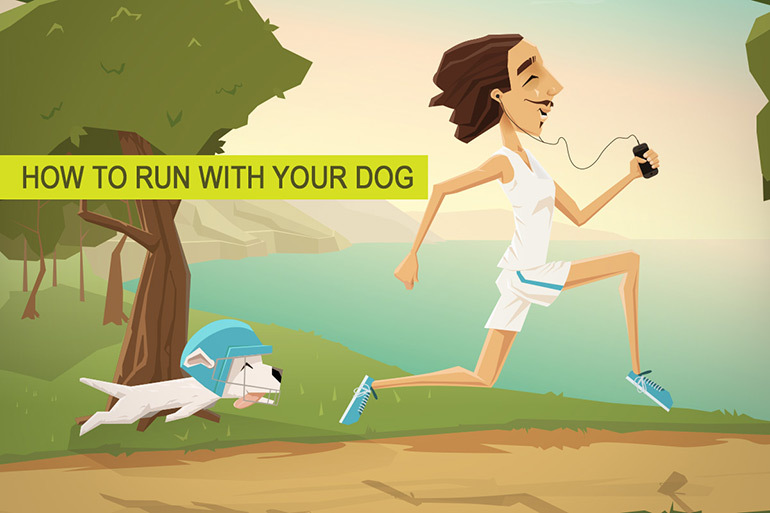 Running with your dog should be mutually beneficial and enjoyable for both of you. Running with a dog can add a new dimension to your workouts. Make sure you look after your four-legged friend and he’ll be your willing running partner for years to come.